At this time, there are no federally required minimum levels of retroreflectivity for pavement markings. On April 22, 2010, a standard for maintaining minimum retroreflectivity of longitudinal pavement markings was published as a notice of proposed rulemaking in the federal register. A Supplemental Notice of Proposed Amendment (SNPA) proposes a revised set of standards to be incorporated in the MUTCD. The documents listed below are final drafts. The official version was published in the Federal Register on January 4, 2017, and may be viewed along with all the official supplemental documents at www.regulations.gov. Search for FHWA-2009-0139. This document, developed as part of the rulemaking process, provides the background and detail explaining the proposal. This link shows the proposed pavement marking retroreflectivity MUTCD text. 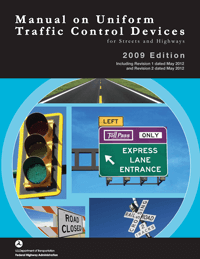 This report is referenced as guidance in the SNPA MUTCD Language. It provides detailed information on methods that may be used to comply with the proposed standard. This report explains the analysis that was performed to estimate costs and potential benefits associated with SNPA. Please submit all comments to the docket. Proposal for a standard for maintaining minimum retroreflectivity of longitudinal pavement markings published in the Federal Register on April 22, 2010. This document, developed as part of the rulemaking process, provides the background and detail explaining the proposal. This link shows the proposed pavement marking retroreflectivity MUTCD text. Note that this proposal was named Revision 1 to the 2009 MUTCD at the time this NPA was published. Since that time, FHWA published Revisions 1 and 2 to the MUTCD, unrelated to pavement marking retroreflectivity. Amendments are numbered in the order that final rules become effective, therefore the actual revision number for pavement marking retroreflectivity will not be assigned until a final rule is published. For hard copies of documents with publication numbers, please send a request to report.center@dot.gov and include the publication number and title, along with the number of copies and your mailing address and phone number. Requests will be filled based on availability.